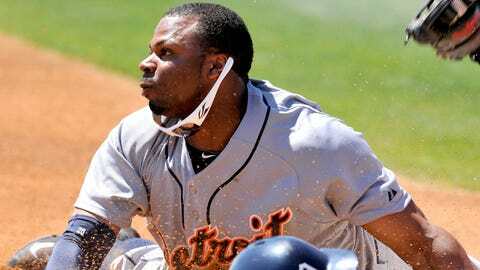 Detroit signed Rajai Davis for two years at $10 million in the offseason to provide spark with his legs. Speed and the Detroit Tigers have pretty much mixed like oil and water since Ty Cobb departed 88 years ago. Detroit hasn’t had anybody lead the league in steals since Brian Hunter swiped 74 in 1997. And Ron LeFlore, with 68 steals in 1978, is the franchise’s only other leader in that category since 1930. But new starting left fielder Rajai Davis could change that. He should steal more bases than the entire Tigers team did in 2013, when, with 35, they had the fewest in the majors. Detroit signed Davis for two years at $10 million in the offseason to provide spark with his legs. He’s averaged 43.2 steals per season over the last five years, and topped out at 50 with the 2010 Oakland A’s. He had 45 in 2013 and 46 in 2012 for the Toronto Blue Jays, and threatened league leaders Jacoby Ellsbury (52 in 2013) and Mike Trout (49 in 2012) the past two seasons. "I like to take advantage of what you give me," Davis said. "If they give me the base, I’m taking it. I look at every little thing a pitcher is doing to try to get that extra step before I take off. I like to be aggressive, but stay under control." Davis has made a study of stealing bases, and picked the brains of Rickey Henderson, Vince Coleman and Kenny Lofton on the topic. 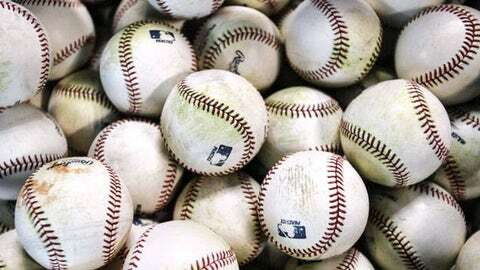 Henderson surpassed Cobb and Lou Brock to become the all-time theft king, and Coleman and Lofton are among the top 15. Davis can steal even when everybody knows larceny is surely on his mind, and his first steal for the Tigers was a perfect example of that. In Saturday’s game against the Baltimore Orioles, Davis hit a lead-off single, and pitcher Bud Norris immediately threw to first in an effort to keep him close. Davis, however, got back easily. Norris threw again and again, and after those three attempts to thwart his momentum, Davis took flight on Norris’ first delivery to the plate. Davis easily beat the throw from catcher Matt Wieters, who last year gunned down a higher percentage of base stealers than any other American League catcher. Ian Kinsler then gave himself up, hitting a grounder to second base to get Davis to third with one out. It was a "small ball" approach the Tigers have seldom played because they’ve lacked a legitimate base stealer. It’s also an element that could be important in the postseason, when runs can be hard to come by if the power hitting wanes. In Saturday’s instance, Torii Hunter scored Davis with a homer, but a fly ball or grounder also would have brought him home. What’s his steals goal for this season? "If I’m on base a lot," Davis said, "I’ll have a lot of stolen bases. I don’t really think about the number I’ll get." He said that matter-of-factly because he knows his statistics back the claim. Davis challenged for the league lead in steals last season with only 331 at-bats, and has three steals in four attempts after playing five games this year. If he hits well enough against right-handed pitchers to not require a platoon partner, Davis’ number of steals could be staggering. When lefty Andy Dirks required back surgery that will cost him the first three months of the season, Ausmus said that Davis — a right-handed hitter — could be the only left fielder he needs. Ausmus dangled the carrot for Davis, who’s hitting .294 with one homer, four RBIs, three runs and a .350 on-base percentage. "I’m just going to go out there to help us win," Davis, 33, said of the opportunity. "I’ll do my best and let the manager decide how much I play." He’s off to a decent start on making his case to play almost every day. Davis is hitting .250 against right-handers. He never ran track, but said he once rushed for 300 yards as a tailback for New London (Conn.) High. "Football is my best sport," Davis said. "But I didn’t have a love for football, and I didn’t like to get hit. Running scared is what I did in football." Scaring opponents when he runs in baseball is much more to his liking. Davis was a 38th-round pick by the Pittsburgh Pirates in 2001, and was two weeks away from completing his sixth season in the minors when Pittsburgh called him up. "It took me five years in the minors to really learn how to steal bases," Davis said. Never mind that he stole 40-plus in each of those last four years in the minors. It wasn’t the totals that mattered most to him, but rather learning all the nuances of his craft. While in the minors and majors, he spoke with three of the top base stealers in the history of the game: No. 1 Henderson (1,406 steals), No. 6 Coleman (752) and No. 15 Lofton (622). "I talked to Rickey, Vince and Kenny and learned from each of them," Davis said. "Rickey was so aggressive, but really focused on the little things that told him the pitcher was going. We talked about those things. "Lofton reiterated what Rickey said and had some other insights into pitchers. Coleman stressed the mentality to go and be relentless — being pretty much fearless of being thrown out. "The toughest thing about stealing at this level is having that confidence." "Oh, yeah," said Davis, smiling slowly and nodding.